Campaigns needing to share their data with the GOP Data Center can now do so for walk data. Phone Bank data sharing will be coming soon. 1) In the old menu, click "Campaign Settings", scroll down to Data Sharing, and check the option to send data. That will submit a request to setup sharing. We will notify you when activated. 2) Configure your Groups that will be used for your walk responses by going to Group Management and editing any groups that need to be sent. 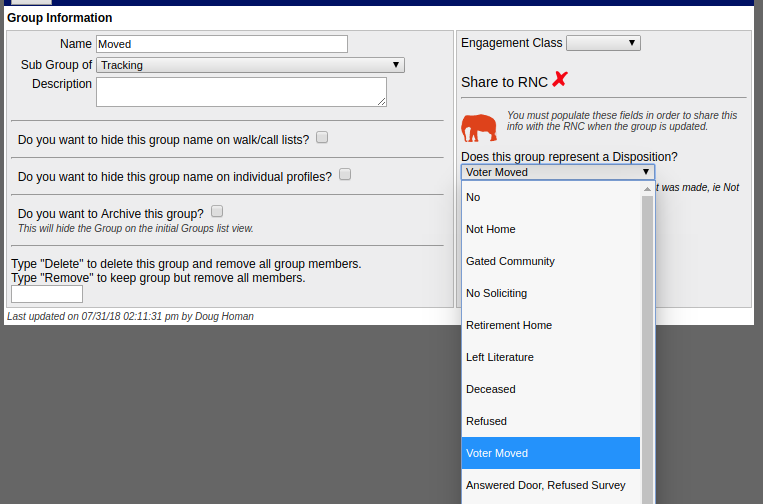 If a Group is used to identify that no response was obtained from the voter, choose the matching Data Center Disposition value. 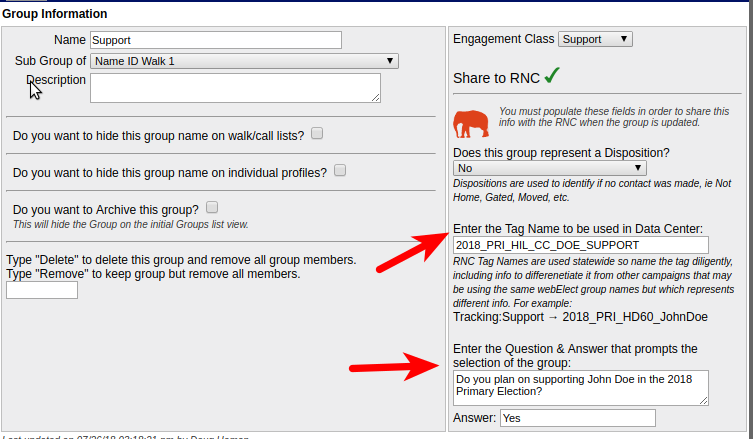 If a Group is used to Tag a voter, set the proper Tag Name and the Question and Answer which prompted selection of the Group. 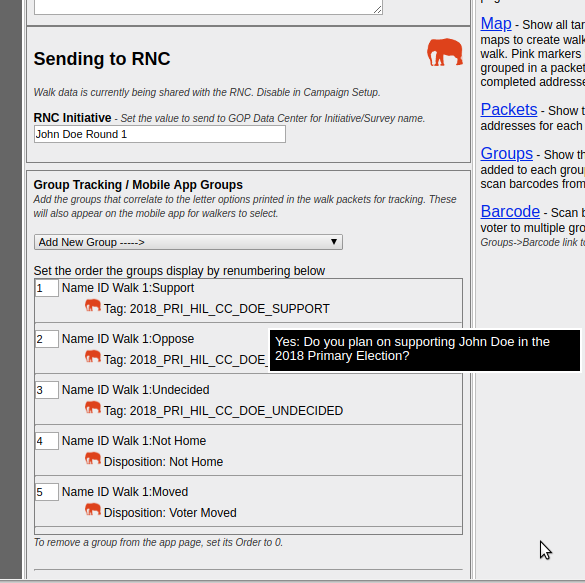 3) When configuring your Walk Project, set the initiative or survey name to be sent to the RNC for the walk. 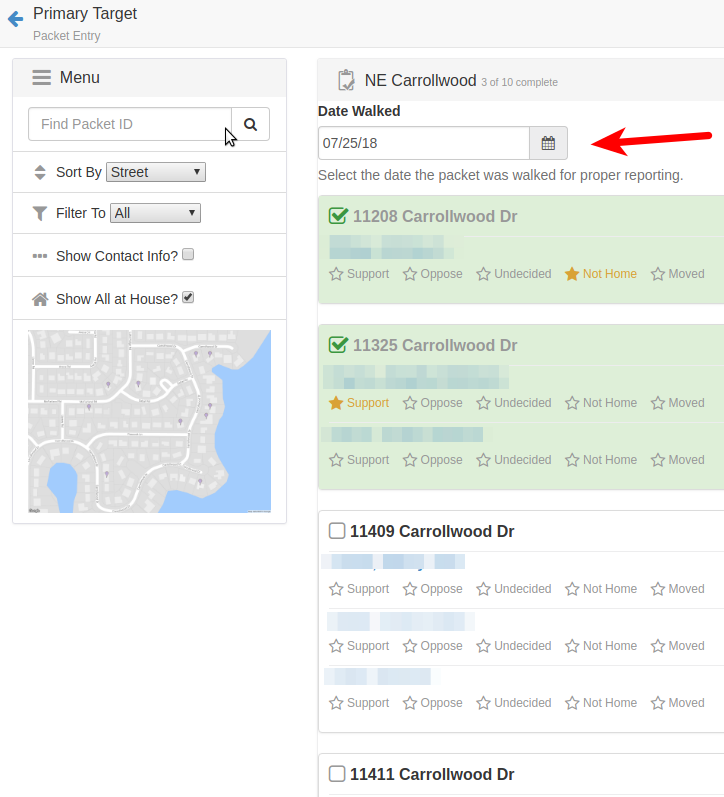 After adding the groups to display in the walk app survey and saving the target, the Groups that you previously configured to send to Data Center will now show how they are mapped to Data Center as a Disposition or a Tag Name. Hovering over a tag will show the corresponding question and answer prompting the Group selection. 4) If entering results for printed paper packets, use the Packet Entry Form. Set the date the walker completed the packet, then click the responses matching the paper packet. Data getting sent to Data Center is first queued on the webElect servers. A task runs every minute to send new records to Data Center. Updates from the mobile app are first queued on the device until a data connection is available, then posts to webElect where they are queued to send immediately to Data Center.